Born in Grimsby 1953, I studied as both graduate and undergraduate at the Slade 1972-1977 where I was awarded the Boise Travelling Scholarship to Italy. In 1986 I was appointed lecturer at the Slade and from 1989-2002 directed the Slade Summer School and the Affiliate Programme. I am currently Senior Lecturer on the graduate painting programme, Co-Director of The Material Research Project and Director of the Material Museum. My work is concerned with the interactions of measurement, space, light and colour and employs a wide range of material and medium including, pigment, mosaic, gold leaf, image transfer, wax, limestone and various printing processes. The work draws attention to the nature of archiving, historic materials and ideas of craftsmanship, incorporating traditional and contemporary techniques. It explores the relationship between the object and the subject of painting; the intervening space between the idea and the touch and the emotional separateness of making and the expanse of time between these events. A great deal of my practice involves the investigation of methods and materials, mostly those that relate to painting, which are central to my practice and increasingly important in my teaching. I am interested in how the contemporary painter considers, believes or understands that knowledge of methods and materials is relevant to the creative process. A key part of my research creates situations that empower the practitioner by paying attention to the activity of making and reaffirming the understanding of craftsmanship and materials and their implications in aesthetic decision making. In 2003 I was invited to be Artist in Residence at the Usher Gallery, Lincoln and during this period I made a number of installation works, which were the beginning of an ongoing series of installations works entitled ‘The Journeyman Works’. These works deal with ideas of pictorial illusion in architectural spaces and incorporate ideas relating to the understanding and investigation of the painter’s craft. 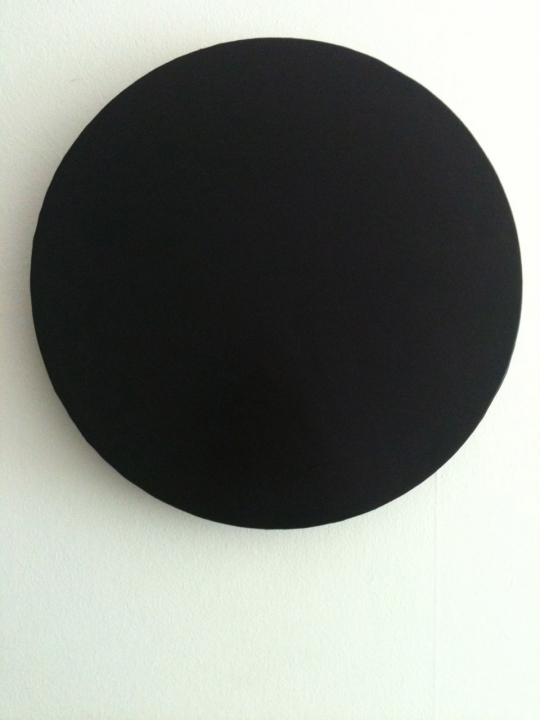 All works have an understated an metaphysical quality and their temporary nature is an important part of their process. This project led to the development in 2008 of a collaborative partnership Simson&Volley with Henrietta Simson, which includes the use of 2 & 3 dimensional works, projection and sound. In 2009 I was elected a brother of the Art Workers Guild. From 2012-16 I served on the Cathedrals Fabric Commission for England Appointments Committee and since 2016 the Fabric Appointments Committee of Coventry Cathedral. Recently I completed The Pigment Timeline, a visual historical timeline of natural and manufactured colour made from 180 pigments, sequentially ordered chronologically as they emerge onto the artists’ palette from the Neolithic to the contemporary. I am currently working on a UCL CHIRP Small Research Grant – The Pigment Timeline Project with Dr Ruth Siddall and Gary Woodley. Also a , Grand Challenges Sustainable Cities Small Grants, UCL, From Pigments to Solar Power, with Dr Hugo Bronstein, Dr Ruth Siddall and Onya McCausland. My experimental approaches to questioning how and why we engage with materials have been at the forefront of my teaching. In 2012 I jointly developed the Materials Research Project (MRP), which along with colleagues at the Slade, has led to the development of the MRP Mobile Workstation (with Gary Woodley), the Pigment Library and handmade Colour Charts. I am Principal Investigator on AHRC-funded Collaborative Doctoral project with artists’ suppliers Winsor & Newton, ‘The Materials Research Project: From Landscape to Colour’ (2013-2016). I was awarded the 2013 Provost’s Teaching Award for my work in highlighting the importance of material understanding to the processes of making. I am currently writing the Art School Guide to Material Practice, Vol.I Supports, Grounds & Surfaces. harcoal Works is an exhibition of commissioned artworks that have been produced with the charcoaled remains of the iconic oak sculpture ‘Place’, that stood on the Forest of Dean Sculpture Trail for 29 years. In October 2015 a charcoal ‘clamp’ was built on the same location in the forest where the oak sculpture had stood. For three days and two nights, beneath a huge earth covered mound, an intense heat steamed, smoked and slowly carbonised the wood. The exhibition at Hardwick Gallery brings the recycling of a single artwork into multiple elements full circle, and Onya McCausland has invited 16 artists to produce new work from the charcoal according to their diverse practices. The exhibition includes works by Edward Allington, Sophie Bouvier Auslander, Jess Bryant, Marcin Gawin & Malgorzata Lucyna Zajac, Joy Gregory, Tess Jaray, James Keith, Sam Llewellyn- Jones, Lisa Milroy, Onya McCausland, Jayne Parker, Lotte Scott, Joy Sleeman, Andrew Stonyer, Kay Tabernacle and Jo Volley. Cities Methodologies 2014 took place in October 2014. Click on the poster for the programme (pdf). For this edition, we received a record number of applications from urban researchers across the globe to exhibit and showcase their work in the week-long programme. The successful applicants represent the bredth and interdisciplinary nature of the study into urbanism and cities. Internationally, the work spans countries as diverse as India, Hong Kong, Kenya, Japan, Lebanon, Italy, Brazil, Turkey, Ethiopia, Greece and the United States. The programme features innovative means of researching the city, from an interactive performance that questions the formation of urban space through storytelling, a series of walks using technology in Soho, photography in Hackney and graffiti in Waterloo, to the launch of Urban Pamphleteer #3: Design & Trust. This edition of Cities Methodologies also launched Cities Imaginaries, the new Urban Lab programme of events and research on the representation of cities in literature and media. The novelist and academic, Amit Chaudhuri, gave a lecture on 'The New Provinces: A writer's changing relationship to the ordinary in the time of globalisation'. Simson&Volley’s new work for the Material Museum attempts alchemy: transforming base metal into gold. *Meister Eckhart c.1260-1328, German theologian, philosopher and mystic. The Material Museum (Est. 2012 at Slade School of Fine Art, UCL.) promotes knowledge, understanding and appreciation of the role of materials within thinking and making. Turning Landscape into Colour investigates the origins of earth pigments - ochres - in the landscape and considers their significance as contemporary cultural materials. 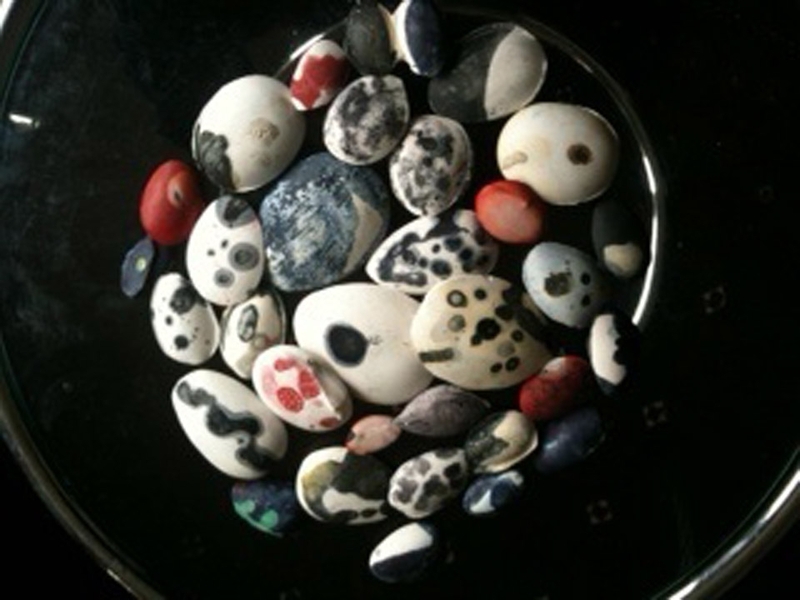 This project will explore the variations between different colours collected from separate sites across the mid Pennines. Onya McCausland has invited researchers from different disciplines and institutions to contribute. McCausland will bring the collected earths to the Artists' Studio and begin processing the raw material, turning it into ochre pigment and finally paint. Exhibition of the founding members of Oficina Bartolomeu dos Santos (OBS). Priest and artist Gianni Notarianni O.S.A. (Order of Saint Augustine), and artists Robert Phillips, Rose Davey, Donal Moloney, Kieren Reed and Sarah Kate Wilson have invited eighteen established and emerging artists including Ed Allington, Nick Goss, Bruce McLean and Jo Volley to show in Chapter, the inaugural show at Austin Forum. The exhibition takes place at the Augustinian Centre, 55 Fulham Palace Road, London W6 8AU, from 21 June - 4 July 2013 and the show is open Tuesday - Sunday 11am - 7pm, and Monday by appointment. A collaborative installation with Henrietta Simson, as Simson&Volley. Part of Cities Methodologies, an annual exhibition and events programme showcasing recent innovations in urban research methods and cross-disciplinary work on cities worldwide. An exhibition presenting the collaborative research of Jo Volley and Onya McCausland, Slade School of Fine Art, UCL, Dr Spike Bucklow, Hamilton Kerr Institute, University of Cambridge and Dr Ruth Siddall, Earth Sciences, UCL, investigating five materials extracted from the British landscape: chalk, iron oxide, coal blakc, copper and graphite. Collaboration with Henrietta Simpson as Simson&Volley. The exhibition (co-curated by Natalie Gale and Rachel Macarthur) saw the fabric of West Dean House reassembled, remapped and retold “like a die-cut book” as the artists subverted various spaces through intervention and installation. Entitled 'Ich Bin Der Welt Abhanden Gekommen', a collaborative artwork with Henrietta Simpson as Simson&Volley, part of an exhibition curated by Lucy Newman Cleeve. 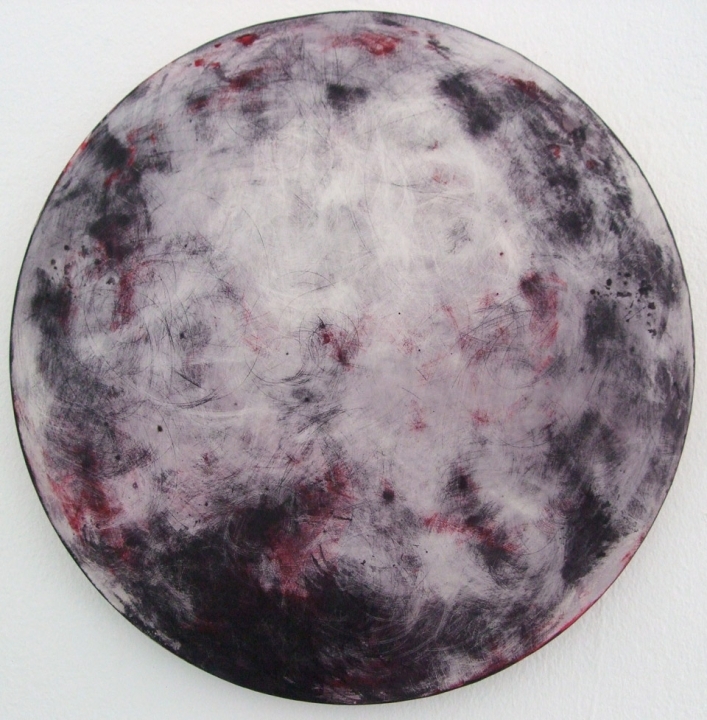 Disc, a collaborative artwork with Henrietta Simson as Simson&Volley. Videoooooh was a collaboration between the Slade School of Fine Art, UCL The One Minutes Foundation, Amsterdam and the Flemish/Dutch house de Buren, Brussels. The exhibition comprises 212 one minute videos made by 193 artists from 33 countries on the subject of Sport, Like/Dislike (truly Olympic) to conincide with the London Olympics. 'Green to Gold', by Simpson&Volley is an installation displayed as part of UCL Cities Methodologies, an annual exhibition and programme of events showcasing innovative urban research methodologies. In 2011 the City of London Corporation launched a campaign, Green to Gold, in an attempt to get more people involved in sport and activity with one year to go to the London Olympics. Its aim was to engage and inspire communities to use open spaces for positive recreation. Green to Gold transforms the image of an open green space into a pulsating gilded geometric form. It is part of a series of temporary installation works that deal with the overlap and associations between memory and place and allude to the poetic possibilities held within a landscape in which inner and out vision are reconciled. The work also refers to the golden coffer ceiling paintings by Veronese in the Cheisa di San Sebastiano, patron saint of sport and athletes, in Venice. An exhibition and symposium exploring artistic process. Collaborative installation 'Project, project, Protest!' 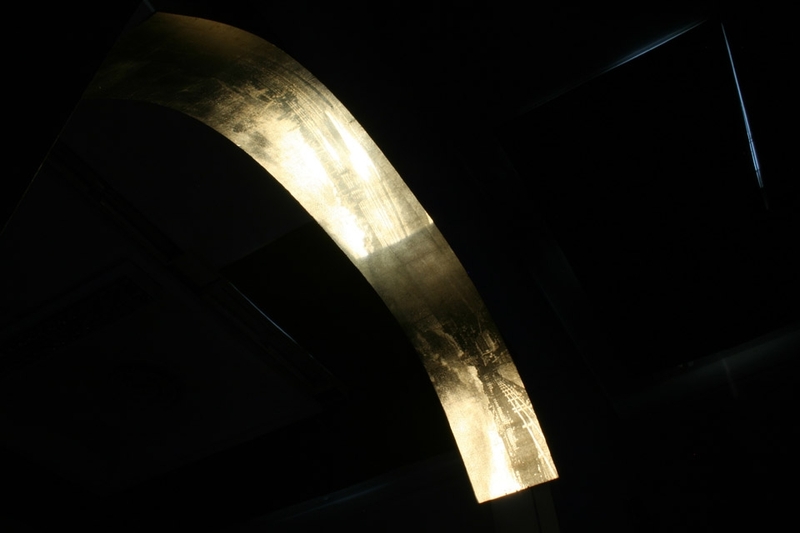 collaboration with Henrietta Simson, as part of UCL Cities Methodologies 2011. An exhibition of sketchbooks by contemporary artists, architects and designers. Artists' work made in response to the Kardo Sesseoff collection at Portsea Place, London. Collaborative artwork with Bruce McLean, Estelle Thompson and Gary Woodley entitled 'Wardrobe Work'. 'Sameness & Difference' is a group show that explores the current trend in contemporary art for artists to utilize furniture within their practice. Exhibition by Simson & Volley running concurrently with sculptor Elizabeth Mead. List of works: 1. 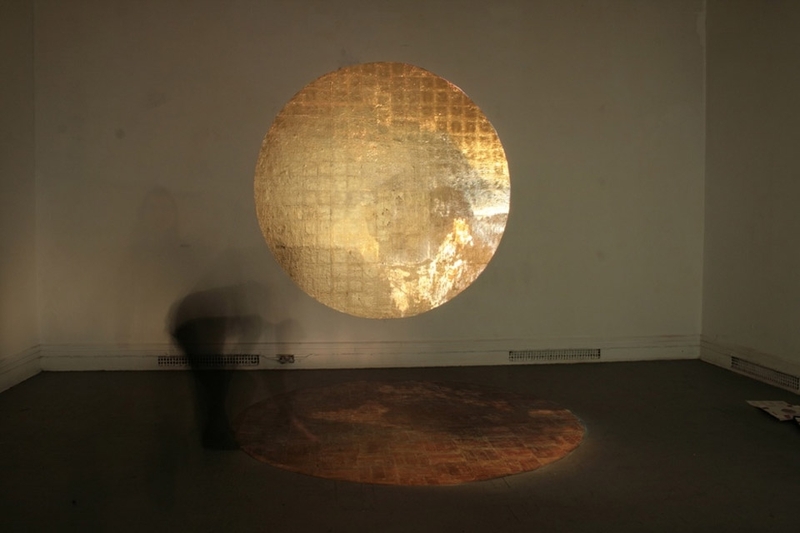 Place - Gilded circle with sound and projection (acetate) 7ft. 2. 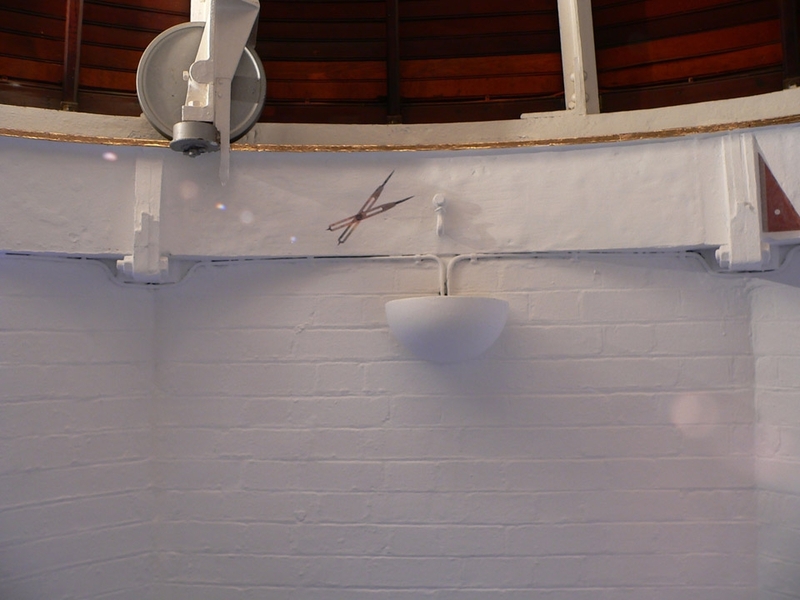 Ellipse - transfer images of the sea at Portsmouth, UK	7ft. 3. Frieze - Graphite drawing directly onto wall in corridors dimensions to be decided 4. Objects for cases: JV/PI/09 a. 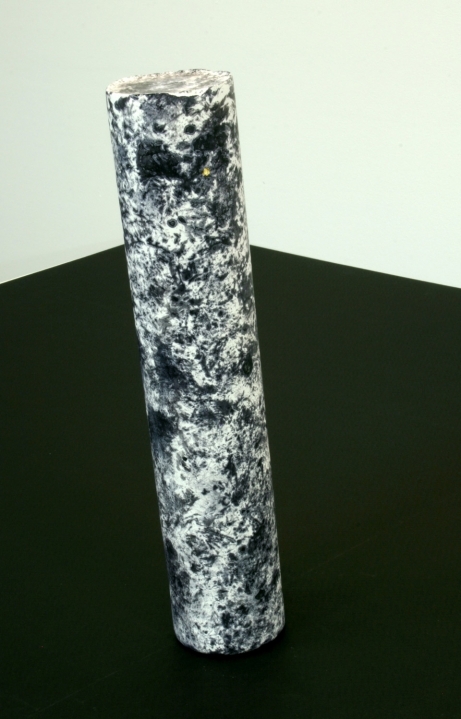 Pillar I - plaster and iron gall ink 14’’ x 2 ½’’ JV/PII/09 b. Pillar II - plaster and iron gall ink, pigment 9 ½ “ x 2 ½’’ JV/PIII/09 c. Pillar III - plaster and iron gall ink, pigment 9” x 1” JV/U/09	d. Urchin - plaster and iron gall ink and gold 4” diameter JV/FI/09 e. Fragment I – plaster and iron gall ink 3’’ JV/FII/09 f. Fragment II – plaster and iron gall ink 1 ¾ ‘’ JV/FIII/09 g. Fragment III – plaster and iron gall ink	1’’ JV/FIV/09 h. Fragment IV – plaster and iron gall ink, pigment 3’’ The exhibition ‘spaces/places/senses/places/senses/spaces’ came about by invitation from the American Sculptor Elizabeth Mead who I had previously made work and shown with at the Casa das Artes de Tavira, Portugal, 2004. The Visual Arts Center is the art school of Tidewater Community College and is located in the historic section of Olde Towne, Portsmouth, VA a city of 100,000 people situated in the Hampton Roads metropolitan area with a population of £1.5M. It serves 1.121 students annually in both studio and art history programmes. They gallery comprises of four basic spaces intended for educational, student and public use. 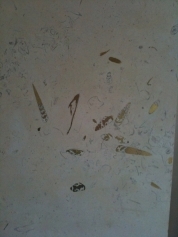 There is a permanent art collection, including the Hisayuki Yamaie silkscreen prints and an archive. A committee led by Shelley Brookes Exhibitions co-coordinator along with VAC Director, select six major exhibitions each year, chosen from proposals from both national and international artists. VAC has received statewide recognition as a model for college and university art schools. Our aim was to import the light, sounds and imagery of Portsmouth, UK to Portsmouth, VA. To explore the overlaps and associations between memory and place and allude to the poetic possibilities contained within the sea. The work deals with haptic perception and the nature of the object and image embedded within the fabric of its entwined histories. 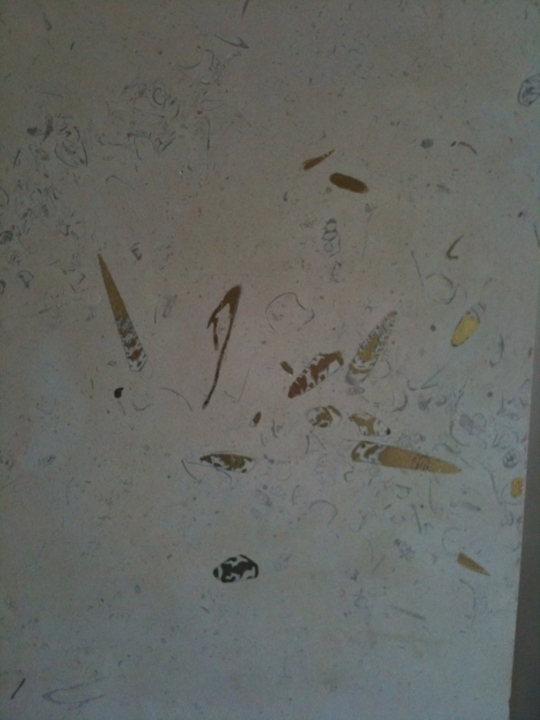 The materials range from the traditional: gold, graphite, iron gall ink and plaster to the contemporary: photography, image transfer and computer generated imagery and sound. 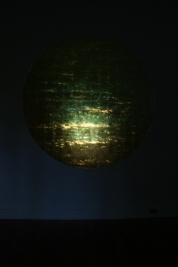 From the ethereal projected gilded image to a reconstruction and interpretation of Debussy’s La Mer through a computer sound file. Deep Material Encounters, a symposium coordinated by Onya McCausland which brings together researchers and artists from across the arts and sciences will be held at Clearwell Caves in the Forest of Dean, one of the country’s oldest iron ore mines, on Friday 15th April 2016. The symposium brings together researchers and artists from across the arts and sciences to discuss ways that knowledge is developed, and perceptions altered, through encounters with particular materials, in the context of current ecological conditions. The event will include formal presentations, screening/installation of video/film works and performance. This catalogue is an extension of the exhibition held furthering the exploration of process and motivation. This catalogue brings together three essays that bring to light and explore the many processes behind Euan Uglow and Sargy Mann's paintings. Artist and Professor of Fine Art at Cardiff Metropolitan University, Robert Pepperell's essay, Sargy Mann Euan Uglow and subjective Realism; the Revollutionary Achievement of Modern British Painting, looks at the largely unwritten history of British Artists pushing the boundaries of recording perception in their paintings. Artist and Senior Lecturer at the Slade School of Fine Art, Jo Volley's essay reflects on the influence of Uglow on her own work, both as student and friend and admirer of his work. Volley describes his arduous process and intense study in the life room, revealing the influence of this passion for looking that has so influenced her own practice. Artist Antoni Malinowski has been commissioned to produce a major wall painting in the foyer of the new Mathematical Institute in Oxford, the Andrew Wiles Building. To celebrate and introduce that work Antoni and a series of distinguished speakers will demonstrate the different impacts and perceptions of colour produced by the micro-structure of the pigments, from an explanation of the pigments themselves to an examination of how the brain perceives colour. Limited edition artists book to accompany the exhibition 'Turning Landscape Into Colour', North Lodge, UCL, 19 April-7 May 2013. Co-wrote with Caroline de Lannoy, Daniel Preece, Ian Rowlands, and Sandra Smith a 66 page illustrated booklet and on online guide to painting. Organised the overall concept and writing of the workshops and the teaching for the illustrations. Online edition: http://www.guardian.co.uk/artanddesign/2009/sep/20/guide-to-painting-the-tutors Features an introduction by writer and critic Matthew Collins, an article on subject matter by Guardian art critic Laura Cummings and interviews with international artists including Chris Ofili, Cecily Brown, Frank Bowling, Fiona Rae, peter Doing, Michael Craig-Martin there are more are the names needed Contents: Equip Yourself – Materials and equipment The Language of Colour – Colour Theory Mixing it up – 6 exercises on tone, temperature, colour mixing and saturation Seeing things differently – 4 exercises on optical colour mixing, local colour and temperature, grounds and glazing. Colour me happy – 4 exercises on colour relativity, colour composition, optical and spatial effects and mark. Placement and proportion – 4 exercises on scale, space, eye-level and the picture plane. Finding your flow – 5 exercises on gesture, symmetry, shape, rhythm and composition. The guide is designed to develop an understanding colour and composition and the fundamental role drawing plays within that. Its purpose is to explain the basic materials and equipment of the painter’s craft, to encourage and enlighten beginners and be used by more experienced artists to revisit some sound ground rules. It explains and encourages an awareness of the visual world of painting with exercises that have the scope for personal experimentation and invention. They are structured to be worked on sequentially, developing practical skills alongside an understanding of perception. The commission was an opportunity to explore and promote ideas relating to good studio practice and communicate with a large audience teaching methods that have been developed with colleagues for over 20 years. It provided the circumstances to engage in discussion and evaluate the academic and technical possibilities within our practice. 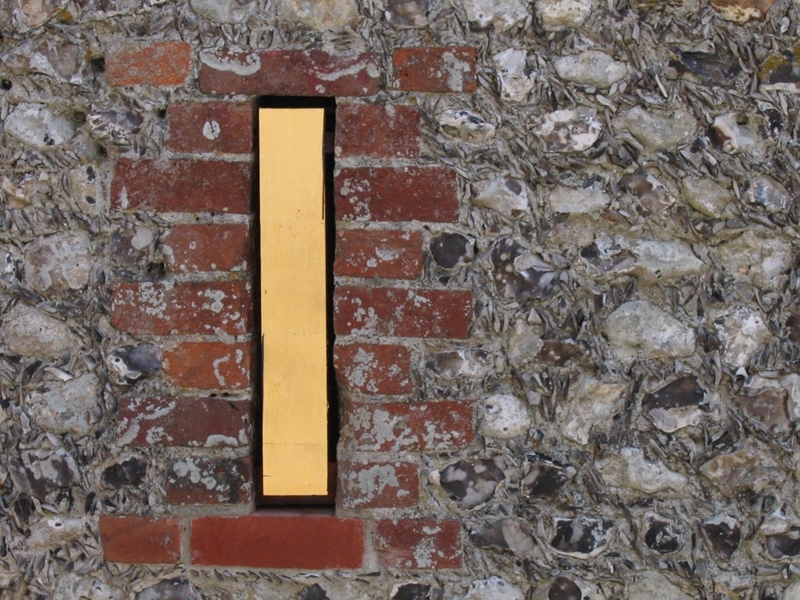 2 x 4 metres panel of Jurassic limestone consisting of 12 pieces from the Lincoln Cathedral Quarry incorporates red gold, moon gold, white gold, Thai temple gold and Dutch metal. Silver Thread is made from Jurassic limestone mined from the quarry, which provides material for the conservation department and renovation of Lincoln Cathedral. The specific cut of the stone, where the small fragments of fossilized shells embedded in the rock for some 200-135 million years are particularly rich, is an important element in the design. 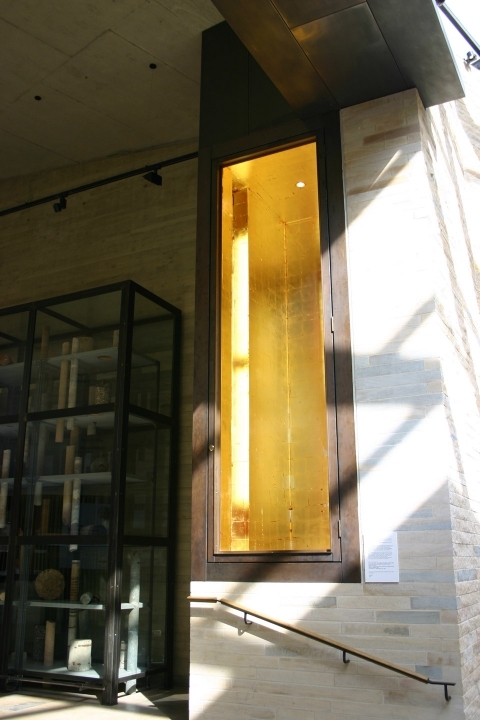 The gilding of the fossilized forms in various coloured gold leaf reveals the hidden circles of ancient time and space, and is inspired by the archaeological objects in the museum’s collection, historic materials and ideas of craftsmanship. 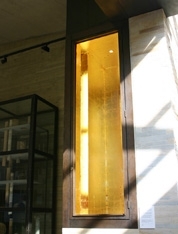 The panels are designed to be situated on a large wall under a sky light in the body of the building to enhance the experience of workers and visitors to the museums offices. The play of light across the surface questions the physical quality of the material and illusionary forms. The Collection completed in 2005 for Lincoln County Council is a RIBA prize winning design by Panter Hudspith Architects and is a landmark building for the city. It incorporates the use of local limestone and its structure creates connecting views throughout that frame the Cathedral both visually and symbolically. The commission Silver Thread was a direct result of a number of temporary installation works made for the gallery over the period 2006-08, a panel for the permanent collection for the Usher Gallery, Lincoln in 2003/4 and a developing relationship with the curators.